Want to Know About Office 365 Native Backup – Here, You Go! In this article we have com up with Office 365 Native backup solution to create backup copies of all the data and archiving it for future reference. For every IT organization, data protection is the most important task as data is the backbone of the whole business. If any of the data is hacked, leaked or lost then it can disturb the balance of the business. However, people implement only a few security measures to protect data. Now, if the situation occurs in which the user’s data is unexpectedly deleted and he/she needs to retrieve it back. What the user will do? Visit this link & Get the latest updates in your mailbox. You can also connect with us on Facebook & Twitter. In the case of Office 365, if we consider the above scenario that is the user’s Office 365 data is lost and he/she want to recover it back. Then, what the user will do? When it comes to Office 365 it offers different Office 365 Native backup solutions to backup Office 365 data and protects it when catastrophic situations occur. 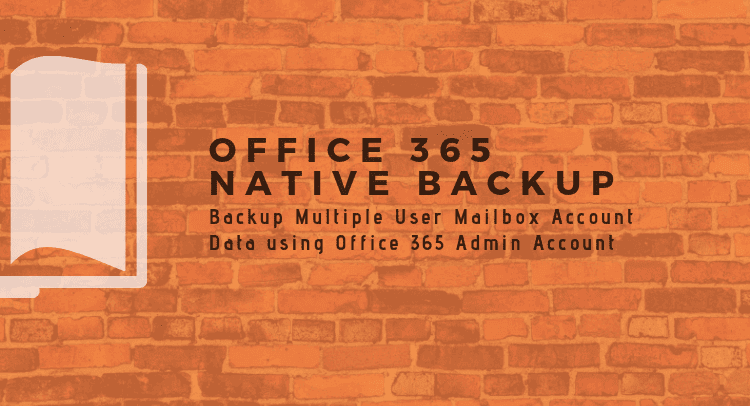 Thus, in this blog, we are going to explain various Office 365 Account Native backup solution to create backup copies of all the data and archiving it for future reference. Why Office 365 Native Backup is Important? To protect and save data for the future need, Office 365 Native backup is very important. However, for the companies who use Office 365 for their business’s data management task. For them, Office 365 Mailbox Native backup also plays a crucial role in legal requirements and unexpected data damage or loss. Avoid the fines and money-related penalties for not retaining the important business information that may be requested for the legal actions and disputes involving the company. There are multiple laws and restrictions that regulate access to vital data. Additionally, it does not matter whether the case concerns government agencies, companies or other organizations. One is bound to respect those regulations. No one can predict the problematic situation that may appear when someone in the organization causes data loss or data corruption which may be crucial for the user’s business. In many cases, unintentionally an important email or contact is deleted by the person. In such a situation, unexpected and unnecessary problems may occur. Thus, to avoid this situation, one must keep the backup copies of all emails, contacts, and calendars. So, that even in the case of permanent deletion items can be restored from a local backup copy. Sometimes, vital data is deleted for a specific purpose. Now, such a piece of information may turn out be relevant for a trial or other legal actions. One should always preserve important electronic data to protect his/her company. This will, in turn, save the business in problematic situations. Additionally, contents of all employee’s mailboxes should be backed up in case of an unexpected disaster on the service provider’s side resulting in partial or complete data loss. How One Can Protect Office 365 Data In Case of Unexpected Disaster? Fortunately, there are some solutions that will help the user to protect Office 365 data in catastrophic conditions. The user can easily download and save Office 365 mailboxes in PST file format via using eDiscovery mechanism which is Office 365 Native backup approach. In-Place Hold or Ligation Hold permits for the maintenance of the mailbox data as long as mailboxes in question are put on hold. However, due to some reason if the user decides to switch it off or fails to switch it on then the user’s data will be removed permanently when the retention period is completed. Moreover, this feature is not available by default for every Office 365 plan. One can also manage the backup process via using an automated approach that is SysTools Office 365 Account Backup tool. The major advantage of using this program is that the user can easily backup Office 365 Online mailboxes to Local Outlook PST file without any problem. Data loss, data hacking, and other problematic situation can occur at any time without the prior notice. Thus, one should always be ready to deal with data loss, data breach etc. issues. Thus, in the above section, we have introduced the complete concept of Office 365 Native backup for all the Office 365 users. This will help the Office 365 users to protect their data in any catastrophic condition. Blogiapa - Learn To Do More! : Want to Know About Office 365 Native Backup – Here, You Go!